Great bakers know that following measurements perfectly is the only way to ensure delicious results! 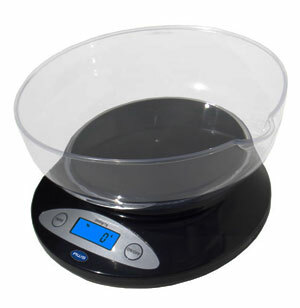 Now you can measure, mix and pour all-in-one bowl with this digital bowl scale! This clever kitchen pal is specially designed to hold both dry and liquid ingredients up to 11 lbs. The dishwasher-safe mixing bowl removes for quick and easy cleaning! Simply place your ingredients in the bowl and check the easy-to-read LCD display. The bowl accurately measures both wet and dry ingredients and you'll be wondering how you ever got along without it. The compact and lightweight design makes it ideal for homes, kitchens, offices, mailrooms, and more. Get ready to cook and bake with spot-on accuracy.